Thanks. Same question--are flights really limited to basic economy? 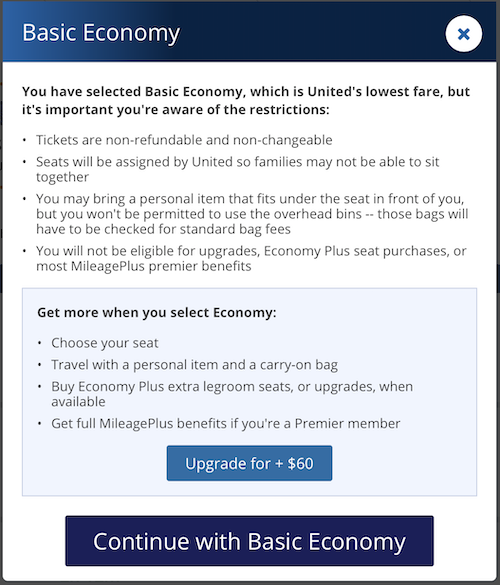 People are reporting that issue with United bookings, but you could try other carriers, or calling in for a booking to see if other classes are available. I think this an issue with their travel portal vendor, not a deliberate policy choice. No, they're not. I just happened to be looking to book a ticket from SFO-SEA and was checking on prices through the discount air portal. When I selected a United flight I got the prompt shown in the attached image. Perhaps it doesn't offer this upgrade if there's no inventory available? The only worthwhile use for the points imo is for travel. I looked up their redemption for flights and it's not bad. Booking flights through their portal is slightly more than what I see the same flights go for on Google flights. For example, $335 vs $315 Google. But you get around 1.34 cents per point so it's pretty good. Redemption for gift cards and cash back is garbage as you get less than 1 cent per point. Question about Primary CDW, I realize the website says that in the terms of the card, but in the guide to benefits that comes with the T&Cs it is very vague, as the word primary is never used. Bullet point # 9 under "what is not covered" on pg 2 says, "Expenses reimbursable by your insurer, employer, or employer's insurance." This leads me to believe that it is secondary, right? Primary CDW is actually quite important in my opinion. Unfortunately I can’t confirm definitively one way or another. I have this exact same concern. On their website and on every blog I’ve found online it says Primary. On the actual T&Cs they have posted online and the physical copy that comes with the card it doesn’t specifically mention primary or secondary. Currently I’m assuming primary until someone says otherwise. Called the benefits people, and rep was pretty adamant that it is Primary. She said the language I quoted only applies if you decide you want to go through your insurance first. If you decline coverage from the agency, and you file a claim through the Infinite benefits first, as long as you meet all the other criteria, the will cover it through primary. Now this is only one rep, and the language in the terms is vague so each to his/her own. Since I pc'd my CSP to CF, this is the only primary coverage card I carry, so like you, Ill probably continue to use it as my car rental card. yah I’m pretty confident it’s primary. I sent an email to my banker to get another opinion. Hopefully it’s one of those things you never need to use but anyone have a real life DP? Are you on the CNO website or the creditsecure website? The CNO website is much more "modern" and has more features. You're talking about City National Online right? Yeah it looks more modern but the creditcare website is the main credit card site right? Like it gives you more control over the account. You're looking at the Visa Discount Air site, for getting $100 off 2 or more round trips, paid in "cash" via CNB Visa, not points. The basic economy issue is a question about the Rewards redemption site. Any recent data points of AA taxes and fees paid on award flights being reimbursed? I'm still waiting to get reimbursed for taxes/fees on a 1/4 purchase. Good news on the calendar year issue: I had some travel credits from 2018 transactions not post until 2019. Made another purchase last week and it was fully credited, based on the 2019 allowance. I will call to complain and escalate, and suggest that others do likewise. CNB seems very responsive every time I contact them. It is completely unacceptable to force customers into BE. Newbie Query: (1) Is there an option to use points for C/F seats? (2) Do you have an option to pay any additional airfare with another credit card (i.e. an airline card that offers perks) or are you limited to the CNB card? Or worse to fares that are less than your points balance. I did a damage claim on an Avis car rental last year. Insurance coverage was definitely primary. No questions or discussion about my personal insurance when I went through the claims process. It took forever to complete, due to issues with the Avis documentation, though all worked out in the end. milypan, jackiesyu and dreamspeed like this.